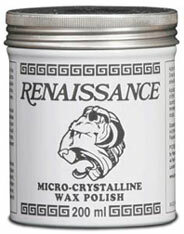 Prior to 1950, the only polishes available were based on beeswax and carnuba wax. Unfortunately, these natural, saponifiable products could cause damage when acids arose spontaneously through oxidation or hydrolysis. To solve the problem, a consortium of international conservationists directed a scientist from the British Museum to conduct research and find the "perfect wax." When he could not find any that met their exacting standards, he created a new wax in his laboratory. The revolutionary formula he invented is a semi-synthetic microcrystalline fossil-origin wax entirely free of, damaging acids. It remains chemically neutral and is therefore completely safe, even on vulnerable surfaces. The British Museum approved manufacture for its own use and for distribution to the public. That "perfect wax" is now available internationally under the name RENAISSANCE WAX. H.M. the Queen's Royal Armorer (at Marlborough House), the Guards Museum (Wellington Barracks), the Gurkha Museum (Winchester), the Military Museums at Aldershot, Royal Green Jackets Regimental Museum, the Gunsmith at Chatham Historic Dockyard (Kent), the Johnny Armstrong Gallery, and Museum of Border Arms & Armor (Scotland), National Museum of Antiquities of Scotland. Belgium: Musee Royal de l'Armee et d'Histoire Militaire-Brussels. Gunsmith at Colonial Williamsburg, the Smithsonian, Metropolitan Museum of Art, Academy of Art-Honolulu, Texarcana College-Bladesmithing & Metallurgy, Rockfeller Restorations, and many many more institutions around the world.